The California Air Resources Board (CARB) has posted proposed amendments to the Consumer Products Regulation. 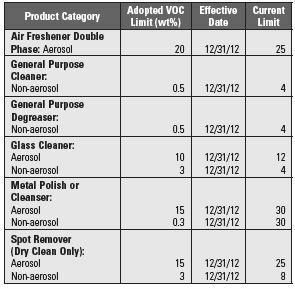 These proposed amendments are for Aerosol Coatings and Aerosol Adhesives. The current limits are not listed because the proposed limits are using the 2010 MIR values, whereas the current limits used the 2001 MIR values. Notice that Fluorescent Coatings and Ground Traffic Markings are proposed to be combined into one category and All Exact Match Categories are to be combined into one category. 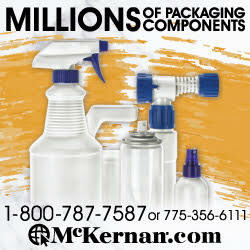 The rest of the Specialty Coatings will have MIR limits; however most of these limits will just be capped. No emissions are expected from the other categories. As mentioned, these new proposed limits are calculated using the 2010 MIR values in the rule. Thus, for most manufacturers, a recalculation of products using the 2010 MIR values posted in the current rule is necessary. Make no mistake, these eight limits will push technology to the limit. In addition, these limits will net CARB 4.73 TPD (tons per day) in emission reductions. Also, there may be several new categories of coatings that will be regulated, but may need to be included into the Non-Flat Coating category. For example, Electrical Coatings may lose the current exemption in the rule, but no new category will be created, meaning Electrical Coatings would be subject to the Non-Flat category. This is a significant issue. 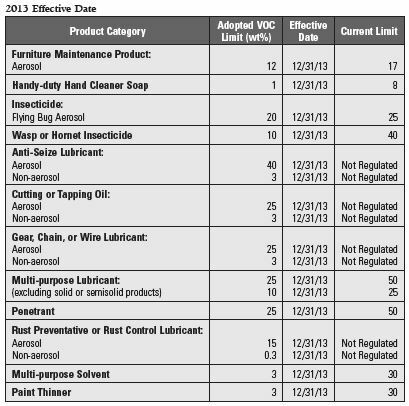 Closely watch these amendments if you currently sell non-regulated coatings. No change is proposed for the Special Purpose Spray Adhesive category. These proposed limits are more challenging and border on technical infeasibility. The complying market shares are zero and close to zero. CARB will need to explain how these limits were proposed. Both the Aerosol Coating and Aerosol Adhesive proposed limits were to be discussed at the Sept. 12 workshop. In addition, CARB will lay out their plans for dealing with the LVP issue for the first time. Stay tuned! South Coast Air Quality Management District (SCAQMD) is pushing forward with its Air Quality Management Plan (AQMP), which includes a provision to eliminate the LVP-VOC exemption from consumer products. As explained last month, SCAQMD has no authority to accomplish this task other than to push CARB to remove the exemption. SCAQMD released a paper on their evaporation studies. It pointed to evaporation of a compound as proof of ozone formation. Industry will need to comment on this issue. Remember, the AQMP is to be heard by the SCAQMD board on Nov. 2. We need all industry participation to comment on this issue and, if possible, participate at the hearing. SCAQMD needs to know this is a significant issue for our industry.